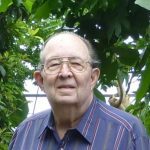 James E. “Jim” York, 86, passed away Monday, November 18, 2018 in Fort Worth. MEMORIAL SERVICE: 10:00 a.m. Saturday at the West Freeway Church of Christ, 1900 S. Las Vegas Trail Fort Worth 76108 with visitation at 9:00 a.m. prior to services. Memorials: In lieu of flowers, please consider a donation to the West Freeway Church of Christ’s missionary effort in India. Jim was born in St. Louis, Okla. on December 4, 1931. He met his wife, Margaret Zorns, in high school in Eunice, NM. Jim attended the University of NM but joined the US Navy during the Korean conflict, serving as a medical corpsman. After his marriage to Margaret in 1953, they lived on Guam then returned to Norman, Okla. where he graduated from the University of Oklahoma in 1958. He was a petroleum engineer. Jim spent his career in the petroleum industry with Amoco Petroleum, beginning in Hobbs, NM. The family lived in Lubbock, Fort Worth, Tulsa, Midland, Hobbs, Houston, Traverse City, Michigan, and Odessa. Jim and Margaret lived in Cairo, Egypt until his retirement in 1989. They retired to Fort Worth and were long-time members of West Freeway Church of Christ. Jim was preceded in death by his parents, Dorotha and Otis York; and a grandson, Jonathan Sloan. Survivors: Wife, Margaret; daughter and son-in-law, Carol and Dr. Tom Sloan of The Woodlands; son, Dr. Russell York of Redding, CA, and youngest son, Robert York and his wife, Georgia of Austin; six grandchildren and four great-grandsons. Jim York was both a great individual and a really thorough and fair manager. I was lucky enough to meet him years before I went to work for him in the time frame of 1980-1981 in Odessa, Texas, for Amoco Production Co. My father, Bill Williams introduced me to him years prior as they both had served together on various SPE (Society of Petroleum Engineers) committee and board positions within their past years working in the petroleum industry of the Permian Basin. A life well lived. I will see you again in eternity. Mr York was a great boss and mentor. I remember him walking through the halls of the Odessa office carrying his coffee cup and stopping in each office to visit and encourage. He taught us to be prepared and to be thorough. He made a lasting impression on everyone who had the privilege of working with or for him. Jim was fine man. I worked with him and for him.